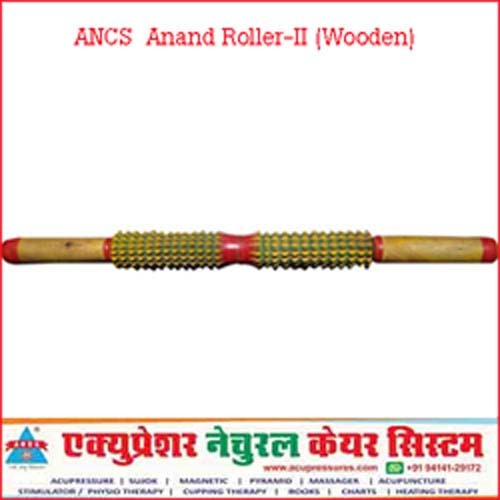 Acupressure Anand Roller-II Wooden is specially designed to use on actual pressure point of the Body. Acupressure Anand Roller-II Wooden is very effective and easy to use. Acupressure Anand Roller-II Wooden be used with slow and bearable, up and down pressure on both side of the spinal column, neck to hip and stroke can be extended up to Leg. INDICATION: Acupressure Anand Roller-II Wooden Treat shoulder pain, sciatica problem, back pain, thigh pain and fatness etc. Acupressure Anand Roller-II Wooden Body Back's Massage Stick Roller is used to stretch muscles, making it an effective treatment for muscle pain and trigger points. Acupressure Anand Roller-II Wooden the foam grip handles and durable construction provide a great, everlasting massage tool. Get rid of compressed stiff muscles and relieve stress with this easy to use stick roller. Acupressure Anand Roller-II Wooden Great for the neck, shoulder, hand, feet, ankle, and back. एक्यूप्रेशर आनंद रोलर का उपयोग कमर दर्द को कम करने ,पैरों का दर्द ,साइटिका दर्द को काम करने ,कंधे का दर्द काम करने तथा एंकल दर्द को कम करने के लिए भी इसका उपयोग किया जाता है ! थाई की समस्या को दूर करने व मसल को मजबूत करने के लिए इसका उपयोग किया जाता है ! इससे हाथो का दर्द से भी राहत मिलती है !